Paul Volcker, chairman of the investigating committee, released the interim report Thursday. Paul Volcker says the oil-for-food program chief violated U.N. rules. UNITED NATIONS (CNN) -- The longtime head of the U.N. oil-for-food program has been suspended from any remaining duties, the world body announced Monday. Benon Sevan is also a subject of an ongoing Justice Department investigation being led by the U.S. attorney's office for the Southern District of New York, according to law enforcement sources who say the program is also under investigation by the Manhattan district attorney. Sevan was the main figure accused of corruption in last week's interim report by an independent commission investigating the United Nations' seven-year, $64 billion humanitarian program for Iraq. The commission is led by former U.S. Federal Reserve Chairman Paul Volcker. "We acted on the report as soon as it came out," U.N. Secretary-General Kofi Annan told CNN Monday. "This is not the end. It is the beginning and we'll act on the other branches of the report as they come out." U.N. spokesman Stephane Dujarric called the suspension "the beginning of a disciplinary procedure respective of due process" and said it could be a first step toward lifting diplomatic immunity for Sevan. Annan has said he would lift the institutional immunity that protects U.N. employees from prosecution by U.S. authorities if a prosecutorial office presented a case. However, immunity can also be asserted by an individual. A senior U.N. official who dealt with contractor selection, Joseph Stephanides, has also been suspended. They have two weeks to respond, Dujarric said. The suspensions could lead to their terminations -- although Sevan, 67 and a U.N. employee for 40 years, is basically retired. He has been kept on the payroll so that he can be available to talk with the oil-for-food investigators. His dollar-a-year salary is a symbolic amount needed to keep the visa that allows Sevan to stay in the United States. Annan said, "We had all worked with Sevan, so long it was a bit of a shock." Under the oil-for-food program, Iraq was allowed to export a limited supply of its crude oil despite sanctions and earmark the revenues for purchases of food, medicine and supplies. The program was in effect from 1996 until the U.S.-led invasion that toppled Iraqi dictator Saddam Hussein in 2003. The commission's report found that Sevan had steered oil contracts to African Middle East Petroleum, a company belonging to a friend that netted $1.5 million by reselling more than 7 million barrels of Iraqi crude between 1998 and 2001, according to the Volcker report. The report said Sevan's solicitations of Iraqi officials on behalf of his friend's company were a "grave and continuing conflict of interest ... ethically improper and seriously undermined the integrity of the United Nations," and that the Iraqi government had hoped Sevan "would act favorably in return" for the allocations. The friend, Egyptian oil trader Fakry Abdelnour, is a cousin of former U.N. Secretary-General Boutros Boutros-Ghali. Sevan's attorney said last week that the U.N. official "never took a penny" and "had no interest" in AMEP "or in any of the other companies associated with the program." 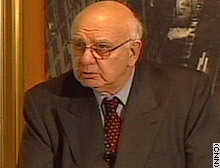 The Volcker report accused Stephanides of using improper influence in the awarding of a major oil-for-food contract at the program's launch in 1996. The report found Stephanides "tainted" the U.N.'s competitive bidding process by giving bidding advice to Britain's Lloyd's Register, which secured the first contract to inspect humanitarian goods coming into Iraq. Lloyd's was replaced two years later by Swiss-based Cotecna, which had employed Annan's son, Kojo. The Volcker committee is still investigating that deal for any conflict of interest. A "definitive report" by Volcker's commission is due by midsummer. U.S. congressional committees also are investigating the oil-for-food program. All of the American contractors on the oil side and the humanitarian side of the Iraq program are being investigated, according to a source familiar with the federal probe. The source said that includes half a dozen energy companies --including giants ExxonMobil and ChevronTexaco, oil refiner Bayoil, and gas transportation and exploration company El Paso -- along with 20 producers of food, medicine and oil supplies, such as oil field equipment supplier Baker-Hughes, pharmaceutical maker Wyeth and conglomerate Tyco International. The companies are said to be cooperative and have complied with subpoenas, according to a law enforcement source. In addition, a number of individuals listed in Iraqi oil ministry records as having participated in the U.N. program are under investigation, including Iraqi-American Shakir al-Khafaji, a Michigan businessman. The Manhattan DA's office has shared some evidence gathered by subpoenas with Volcker's committee, a separate source familiar with the probe said. Volcker's committee does not have subpoena power. The DA is probing not only the program's vendors, but also the role played by middlemen oil brokers and oil traders, including American expatriate Marc Rich, the former fugitive who has remained based in Switzerland even after his 2001 pardon by President Bill Clinton. The DA probe is "following the money," as many of the program's transactions went through big "money-center" banks in New York, according to the source familiar with the investigation. CNN's Phil Hirschkorn, Chris Huntington, Richard Roth and Liz Neisloss contributed to this report.